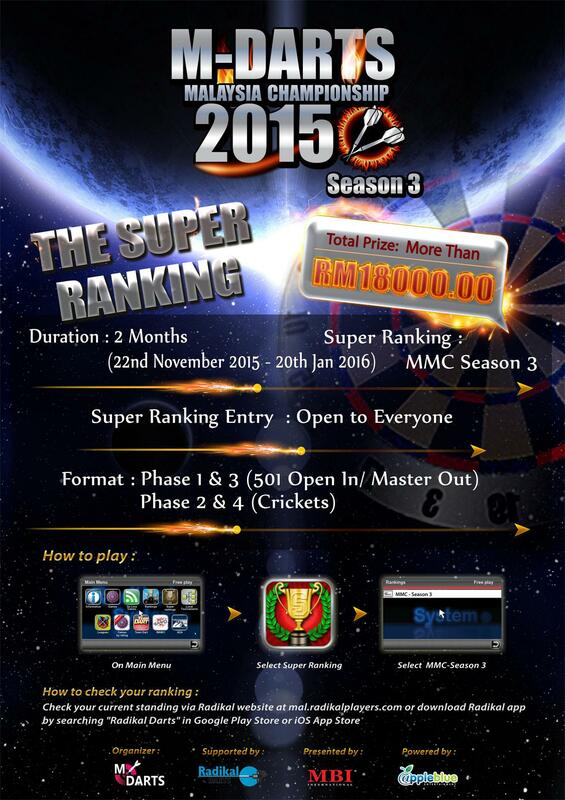 RM 18,000 in cash prizes! 3) If there is a tie for feat or placing prizes, the prizes will be split equally among the tied players. 4) An event will be held at M-Darts outlet for prize giving ceremony. The outlet location will be announce later in our news section on mal.radikalplayers.com. Any winners who are unable to come and collect their prizes will be able to receive the prizes via bank in 2 weeks after the event has ended. Banking details should be submitted together with their I/C or Passport. 8) A player will be moved to an upper category accordingly if the averages of their personal rating increased. How to win this super ranking? Get your best average of 10 games and get ranking placing in your own category. Top 50 from each category will earn points. See following points -table below. Player who earned the highest points accumulated through 4 phase of ranking, will be crowned as champion. Does a lower rated player get a chance to become a champion in this super ranking? In this case, Jenyfer who played in category 8 ranked higher than Stanley who plays in category 1.